Japan Airlines is a favorite son of the OneWorld Alliance when flying to Japan and Asia. Departing non-stop from most major North American cities with state of the art aircraft and a new interior for both premium and economy travelers, makes JAL a Reward Flying favorite. 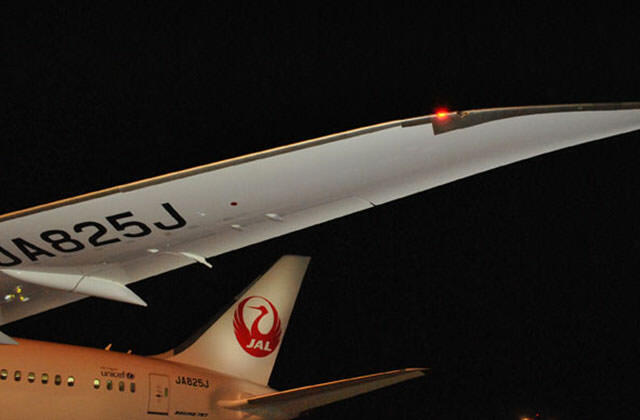 With 36 Dreamliners, 31 orders for A350's beginning in 2019 and 40 Boeing 777's, JAL has a young fleet of international aircraft. Skytrax awarded JAL as having the world's best economy seat. If you are looking for a reward flight to Japan, consider JAL. Luxury at its finest, the JAL First Class Suite has won great accolades among premium travelers. A unique design with wood tones against a natural setting gives the suite a plain and clean Japanese look. Dimensions are a width of 23 inches when seated, expanding to a 33 inch wide and 78 inch long bed. A 23 inch monitor, in seat electronics, reading lamp and ottoman with storage underneath round out the suite. 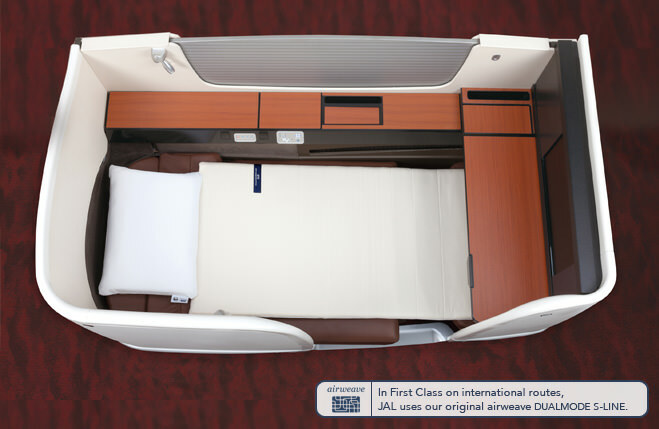 While the JAL premium class experience will be highlighted when dinner is served, when its time to sleep, JAL has recently introduced a new mattress for the suites called "Dual Mode". This mattress incorporates an "airweave" design where one side is soft and the other side is firm. The mattress was originally created for Japanese athletes at the 2014 Winter Olympics. It is available on select first class flights. In addition to all the typical amenities, one item looks unique. The green bamboo massage stick for the soles of your feet. Ever had swollen feet on a plane? Apparently not with this! Take a virtual tour of the first class cabin. JAL primarily flies 767 aircraft regionally to Asian cities such as Singapore or Kuala Lumpur as well as to Honolulu. In the event you find yourself on one of these aircraft, there are three potential business class seats as part of the new Sky brand being implemented. Sky Suite II is the premium seat of the three 767 variants. These appear to ve the Thompson Vantage seats and there are 24 seats in the cabin placed in a 1x2x1 layout. Each seat is 20.5 inches wide and extends 78 inches when lie flat. A 15.4 inch monitor provides entertainment. 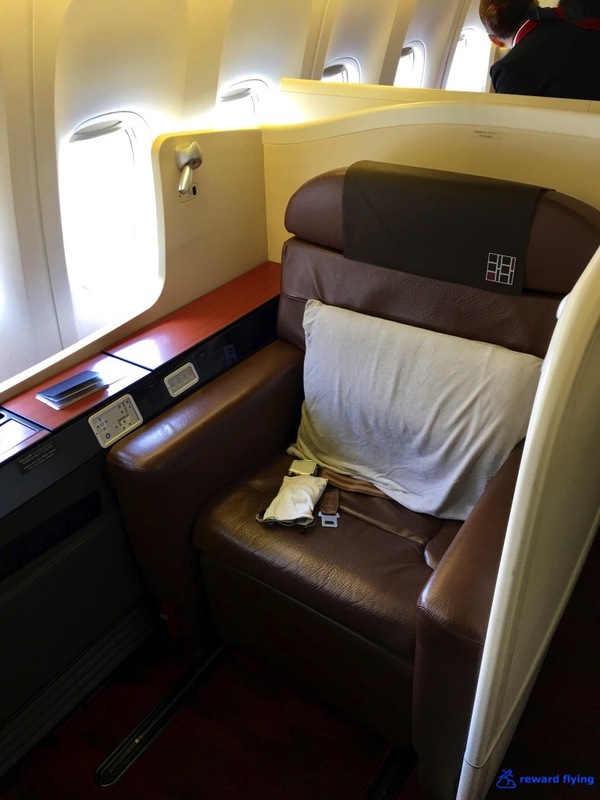 The other two style business class seats are the SkyLuxe and SkyRecliner. The SkyLuxe, pictured on the left, is a recliner seat 20 inches wide and has a 47 inch pitch. The monitor is attached to the armrest and footrest is adjustable. The SkyRecliner has the same dimensions as the SkyLuxe but is more padded, has a touch screen monitor, extra seat back storage and a movable armrest. Seat specifications at the bottom of the page will show you how to distinguish seating on individual aircraft. 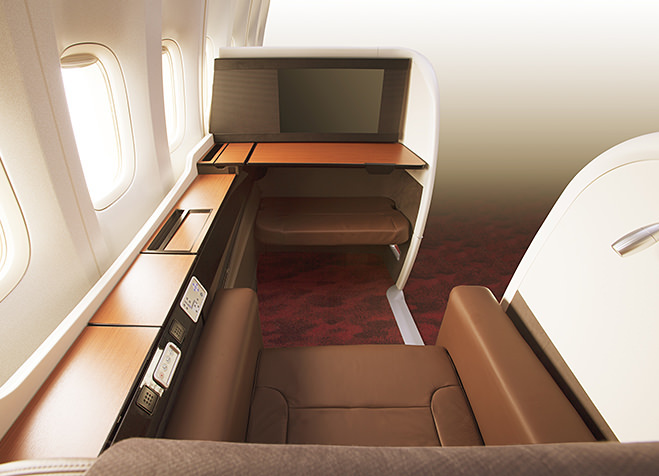 JAL has chosen the innovative B/E Aerospace Apex design as their business class offering, having named it the SkySuite. The arrangement is unique in that it offers row density of 2x2x2, yet gives each passenger direct aisle access and still comes in with a respectable 21.4 inches of seat width, a notch above average for business class seating. When extended the length is approximately 74 inches and the monitor is a huge 23 inches. Under the ottoman is storage space for a carry-on, something many business class seats don't have. SkySuites are installed on all 777-300ER, select 787-800 and all 787-900 aircraft. This link shows all current and future SkySuite routes. Take a virtual tour of the Boeing 787. All 777-200ER aircraft have the Shell Flat seat. These are angled lie flat and regardless of the name do not recline to 180 degrees. They are 22.3 inches wide and have a 60 inch pitch. Other features include a 10.4 inch monitor, retractable privacy partition and power ports. Japan Airlines announced in the spring of 2016 a new seat for 777-200ER aircraft to replace the "Shell Flat" seats. They've dubbed it the "JAL Sky Suite 777 (SS2)". 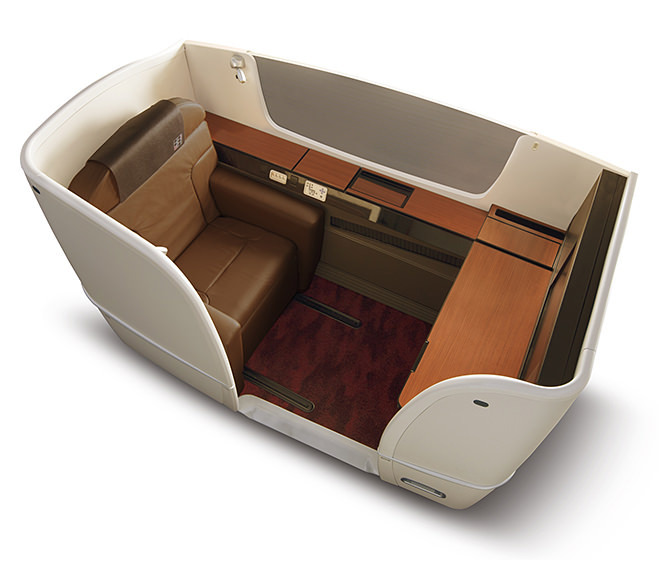 It is a modified version of the Zodiac Cirrus Aero seat used by Cathay Pacific and American among others, in a reverse herringbone layout. Premium economy and economy seats will be upgraded on these aircraft as well. For 787-8 aircraft without SkySuite, they will have the Shell Flat NEO. This is basically the same seat as the the seat on the 777-200 having been updated for the 787. The monitor is 15.4 inches, there is a water bottle holder and a slot for magazines. These do not fully recline either. JAL BEDD is the name of what they refer to as their "flying restaurant" (click to view). Simply put, luxurious dining in the sky. 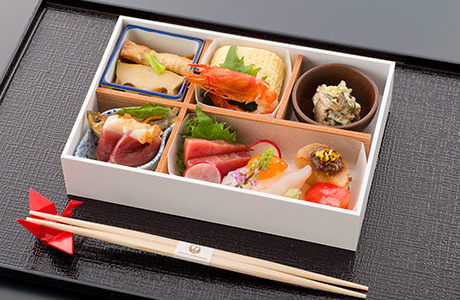 Eight celebrated Japanese Chefs create the flavors to be enjoyed by all premium class customers. Japanese and Western menus are available and can be viewed a couple months in advance. You can even order meals and snacks from the touch screen panel at your seat. Have you flown on Japan Airlines? Share your experience with others in the comments section.